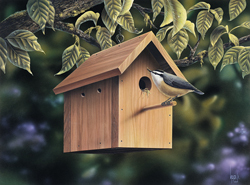 Birdhouses are a subtle way to attract a variety of bird species into your yard. Giving these creatures a small shelter will keep them in your backyard throughout the entire year. Plus, this is a terrific do-it-yourself project that is simple enough for the entire family. Kids love to participate in the creation of a special project and building painting a birdhouse plan is something the whole family can take pride in. Our collection of birdhouse plans includes many types and styles, so you can attract the right birds to your yard. We offer detailed blueprints that allow you to easily build your project and paint to your liking. With a wide variety of plans, we are sure that you will find the perfect do-it-yourself project to fit your needs.